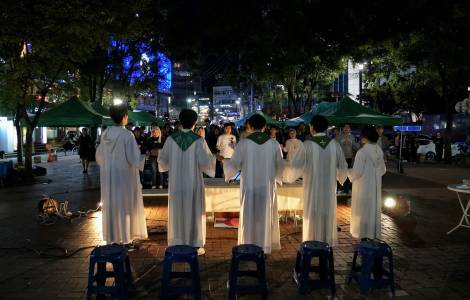 ASIA/SOUTH KOREA - The Korean Church: "Resume dialogue with the North as soon as possible"
Seoul (Agenzia Fides) - "Even if the summit between the US and North Korea did not generate a satisfactory mutual agreement, we hope that the dialogues between South Korea, North Korea and the United States will resume as soon as possible, so that the path towards peace on the Korean peninsula continues": says to Agenzia Fides Fr. Matthias Young-Yup Hur, spokesperson of the Archdiocese of Seoul and Director of the Office for Social Communications in the diocese of the South Korean capital. Fr. Young-Yup Hur recalls the words of Cardinal Andrew Yeom, Soo-jung, Archbishop of Seoul and Apostolic Administrator in the Diocese of Pyongyang, in his homily during the recent Mass to commemorate the 100th anniversary of the Movement of Independence on 1 March: "Peace is the most important and delicate thing that we Korean people should establish on the Korean peninsula today. However, to truly improve relations between the South and the North and bring about genuine reconciliation of the Korean population, we should first of all achieve social integration. That is, our people must be reconciled and united first of all in our minds. "The spokesperson confirms that "the Korean Church will work to bring peace and reconciliation to the Korean people, praying for the special intercession of Our Lady of Peace, Patroness of the Diocese of Pyongyang". South Korean President Moon Jae-in expressed the belief that the United States and North Korea will end up agreeing on denuclearization, despite the failure of the summit between Donald Trump and Kim Jong Un, who met in Vietnam on the 27th and 28th February. "The second North Korean-US summit, although disappointing in its outcome, was an opportunity to confirm the significant progress made through the dialogue between the two countries", said Moon today, urging the parties "to work for a rapid resumption of dialogue because we do not want the deadlock to prolong".